Just like every year, TankFest is full of explosive live action displays where you get to see tanks re-enact historical battles. Starting at 9 am sharp on 24th June, visitors will be able to ride along in famous tanks such as the M548 and Leopard Bathtub. Shortly after that, the event itself will be opened in style with an explosive WW2 reconstruction and demonstration of several tanks. Continuing throughout the day, there will be plenty of WW1 and WW2 tanks entering the arena for visitors to marvel at. 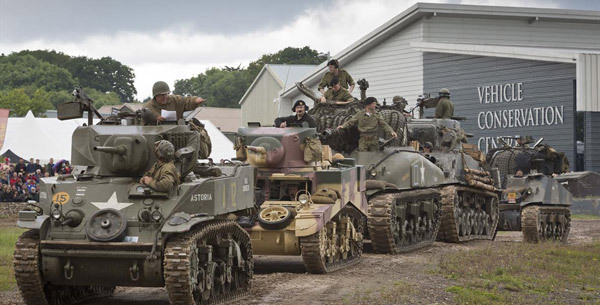 With over 9 live action displays taking place over the course of the day, you’ll definitely get your yearly dose of tanks, explosions, and excitement. To see the detailed itinerary for the day, be sure to have a read on their official website. Aside from the main festival itself, there are also plenty of exhibitions to be seen in the Museum. If you fancy a break from all the loud noises or just fancy a change, you’ll discover a whole new world of tanks inside. With exhibitions covering the history of tanks all the way up to the present day, you’ll be able to browse the museums 300+ strong tank collection. How Much Are Tickets To TankFest? If you want to experience TankFest 2017, then you better act fast! Tickets are very limited for both days, and in the past few years they have actually ended up selling out entirely. To avoid disappointment we recommend securing your ticket as soon as possible, don’t leave it to the last minute. An adult ticket for TankFest will set you back £23 for a full day in the battle arena. Tickets for children aged 5 to 17 cost £14.50 while children under 5 get in free. To save you some money, the museum also offers several family tickets with 1 adult and 3 children costing £56, while 2 adults and 2 children cost £63. Any tank rides at the festival are not included in the price, and additional charges will apply. To book your tickets for TankFest 2017, head on over to the official TankFest website now. If you want to get a good seat at TankFest 2017 then you better make sure you arrive early. With the doors opening at 9am you’ll need to make sure you get up early to beat the traffic and crowds. Why get up early and rush around when you can set off 10 minutes before and still beat everyone else! The Springfield Country Hotel and Spa is only a 10-minute drive away from the Tank Museum. With a range of family rooms available and first class amenities on site, why deal with all the stress and panic of travelling in the morning? Visit our website today to reserve your accommodation for TankFest 2017!